From the Albuquerque International Airport, take I-25 north to exit 282 (about 60 miles). Exit 282 is called both St. Francis Drive and 84/285. (This is the road to Taos.) Go north on St. Francis Drive approximately 3 1/2 miles to Cerrillos Road (seventh traffic light from I-25), merge/turn right onto Cerrillos Road and proceed through two traffic lights. 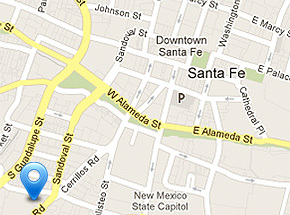 Look on your left for The Santa Fe Motel and Inn at 510 Cerrillos Road, just past Hotel Santa Fe. Take the St. Francis Drive exit, #282, and follow the instructions above. You will be entering Santa Fe by driving southbound on Highway 84/285. When you enter city limits this road is also called St. Francis Drive. Continue south on St. Francis until the fifth traffic light. Turn left at this intersection onto Paseo de Peralta. Proceed to second traffic light and turn left onto Cerrillos Road. Look on your left for The Santa Fe Motel and Inn at 510 Cerrillos Road just past Hotel Santa Fe. 1. The second stoplight on St. Francis Drive is also called Paseo de Peralta. Ignore this intersection, do not turn left here, Paseo de Peralta makes a giant horseshoe around the heart of Santa Fe and this has led to much confusion driving around town. 2. You may not make a left turn from St. Francis onto Cerrillos Road.